There’s a lot of misinformation about DevOps out there — causing some organizations to mistrust the benefits of DevOps practices. It’s time to debunk the common myths, and get on a path to collaborating more effectively and delivering better software, faster. Myth 1: There’s no direct customer/business value for adopting DevOps. 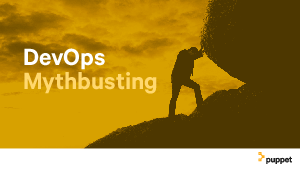 Myth 2: There’s no significant ROI in applying DevOps to legacy apps. Myth 3: There’s not enough time to implement DevOps.